32 akshada manohar awhad 2 dahisar-w.
Assistance given for children’s education under their wing. BETI provides food & clothing for Children in need & education fees and when the monies are needed by those in need. A little 9 year old girl who was suffering from the dreaded cancer. BETI did its utmost to cure her. Underwent hernia surgery with all hospital expenses taken care of, healthy and happy now. A young man & father of a new born infant was given up by his family due to the lack of money for his treatment which was confirmed as Nasal Septoplasty Surgery, which was financially undertaken and done by expert doctors at Kokilaben Ambani Hospital in Mumbai. He is fully cured and healthy. She was suffering for years & the doctors had given up hope of recovery.Beti undertook her treatment which incuded Laproscopic Surgery with all hospital expenses at Sujoy Hospital. She is fully cured & leading a very normal life. A young boy whose entire family was suffering & reeling under the expenses of their child who required treatment for de Addiction and Rehabilitation . His hospital treatment & securing the family was taken care by BETI. A young girl whose parents could not afford to get their young daughter married. BETI took care of her requirements and today she is happily married leading a domesticated life. A 73 year old Mayadevi was Suffering from medical issues for a while,her surgeries of the pancreas at Sujoy Nursing Home in Mumbai were all done under the supervision of the doctors. She is now well and recovered. An Acid victim in DY Patil Hospital whose story appeared in a Daily newspaper. She was attacked by her husband and with her little daughter was thrown out of the house. BETI contacted the doctors and volunteered the costs of her treatment & for the education of her daughter who had never been to school till then. A housewife who for over a decade was unable to use her hands as the problem in the wrists did not allow her to lead a normal life..BETI undertook the costs for her surgery at Belle Vue Clinic in Mumbai. Today she cooks & cleans for her family,leading a normal life. On 13th March 2013 Lalita Benbansi, 21 year old female, resident of Bachhwal, District Azamgarh, U.P. got admitted with history of acid burns in November 2012. She has taken primary treatment at Azamgarh and now admitted with the Plastic Surgery Department in Bombay Hospital for further management. She had sustained acid burns on face, scalp, neck, back and right elbow joint. She has lost her right eye vision and can barely see with left eye. There is complete loss of right ear. She has developed neck and right elbow contracture. Wounds on scalp and back are infected… Beti supported her treatment at Bombay Hospital. There is a vast improvement in her condition & she is no longer confined to the hospital wards. Shabina Khan, aged 16 (at present), was raped by her father 2 years ago. Residents of Chembur, Mumbai - Shabina bravely agreed to come to an event by BETI "NO MORE FEAR-2013" and speak about what she went through so as to encourage others who were in the same situation not to be afraid. At the event ,Sushmita Sen addressed the press as well as all present, that victims such as Shabina have nothing to be humiliated about. The raised funds that evening were collected & provided for others too like Shabina and her family with financial assistance for their domestic and medical expenses. Shabina was also given career assistance in the form of a job at IOSIS MEDISPA, where she works and supports her home & loved ones. 9 years after an acid attack left Sonali Mukherjee blind in both eyes, partially deaf and melted away the skin on the skull, neck, chest and back, the 27-year-old was running penniless from pillar to post in Delhi for help from the government or permission for euthanasia. From Dhanbad, where she was drenched with acid by three of her neighbours after having been subjected to years of sexual harassment, Sonali and her family abandoned their home after she started receiving threat calls from the attackers following their release from jail. "The darkness of the night of April 2 refuses to leave our lives. Before the attack I was harassed and followed around for nearly two and a half years. Scared and frustrated, I complained to my father, who was a watchman in a mill. My father requested the boys to leave me alone, but to no avail. One night it came in the ugliest form – acid. My younger sister was also injured in the attack but she escaped with major injuries,"' says Sonali. She approached the Ministry of Women and Child Development, which, in turn, forwarded her request for help from the Prime Minister's Relief Fund. Meanwhile, her father, who was without a steady source of income, was shuttling between Jharkhand and Delhi's Safdarjung Hospital for treatment. "I am alive and moving around because of the doctors at Safdarjung Hospital. But I lost my grandfather who went into shock after the attack, while my mother slipped into depression. The worst, however, are the continuing death threats that we are receiving from the attackers. They also threatened to attack my sister and brother and kill my parents. We had been running like fugitives to escape them." Her last hope, she says, was government intervention: "If it doesn't come through, I request permission to die. '',she had begged. 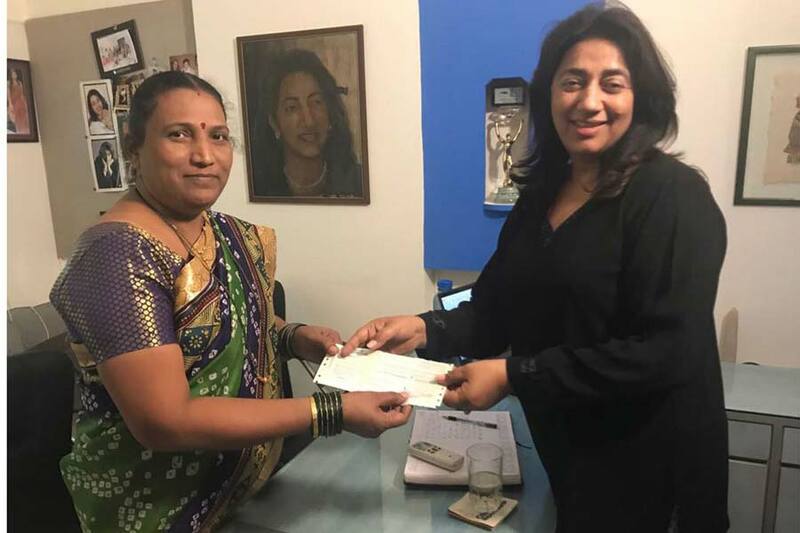 It was then that through Rahul Kanwal of India Today TV who approached Anu Ranjan, who is the founder of NGO BETI and who immediately offered to arrange the funds when she met Sonali & heard her story. She raised Rs. 22 Lakh for her treatment--Off this Rs.12.5 lakh was gathered within 72 hours, thanks to contribution from friends like Juhi Chawla, Mehul Choksi, Ramesh Taurani & Shashi Ranjan. The estimated cost of Sonali's treatment was about Rs 30 lakh, of which Rs 7.5 lakh includes the hospitalization charges which the doctors agreed to waive at BLK Hospital in New Delhi. Now Sonali is married to Chittaranjan and after getting this news Anu Ranjan Tweeted her happiness and invited to her to an all-expenses-paid honeymoon at JW Marriot Hotel ,Mumbai and hosted a reception where lots of well wishers presented the couple gifts .